Artists transformed 33 billboards across Los Angeles this month into giant works of art as part of a massive public art show. The city-wide project, launched by the non-profit The Billboard Creative, began on December 1 with the unveiling of the first set of billboards as more were installed over the following week. 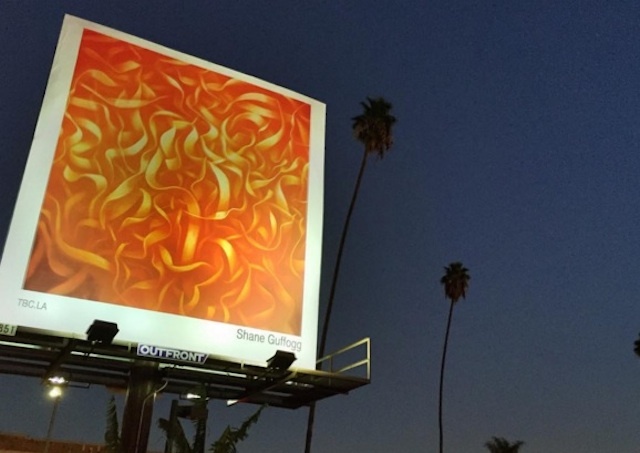 Each billboard features the work of a different contemporary artist, including both emerging and established artists from L.A. and around the world. The selections were curated by artist Mona Kuhn, and include Ed Ruscha, Jack Pierson, Andrew Bush, Shane Guffogg, Kim McCarty, Panos Tsagaris and one by Kuhn herself. Many of the billboards are located around West Hollywood and Hollywood, but you can also find them in West L.A., Mid-City, Echo Park, Silver Lake, and Los Feliz. To track them down, you can use the map on their website or by downloading the ArtMoi Public app. "I want to stop traffic with art," Kuhn explains in a release about the show. For their last exhibit in 2014, The Billboard Creative took over 15 billboards, so they&apos;ve really upped the ante this year. To create the show, the non-profit partners with companies that rent billboards and selects the locations from ones that are currently unused. The rentals are funded by the submission fee artists pay to be considered, which is $26 for the first submission, $6 for each additional piece. The billboards will be on display through the rest of the month, so better get out there and check them out before they&apos;re gone. We&apos;ve selected some of the billboards here, but The Billboard Collective is gradually unveiling them on their Instagram account.